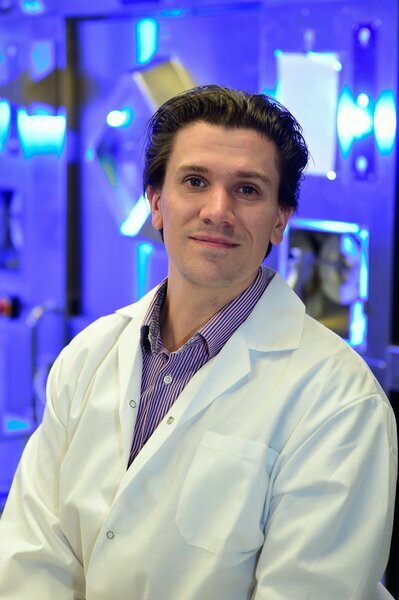 A University of Saskatchewan (USask) researcher has been recognized as one of 30 rising stars worldwide in the field of nuclear medicine and molecular imaging. Dr. Eric Price (PhD), an assistant professor in the College of Arts and Science’s Department of Chemistry, is examining how to improve radiopharmaceuticals, the radioactive drugs that can be used to detect or treat cancers. On March 18, it was announced that Price is one of 30 young professionals who have been identified as “Ones to Watch” by the Society of Nuclear Medicine & Molecular Imaging (SNMMI). “I was very excited, as I was aware how competitive this nomination was—global—and I know that there are a lot of excellent young scientists in the fields of radiochemistry and molecular imaging,” Price said. SNMMI is a non-profit scientific and professional organization, based in Reston, Va., that promotes the science, technology and practical application of nuclear medicine and molecular imaging. SNMMI—which has the ultimate goal of improving human health—represents 15,000 members worldwide. SNMMI is not the first organization in recent months to recognize Price for his exceptional work. In December 2018, for example, he was one of 10 USask researchers honoured by the Saskatchewan Health Research Foundation (SHRF) for providing innovative solutions to the health challenges facing the province. Price was the recipient of a SHRF Excellence Award in the Top Establishment Grant: Biomedical category, meaning he ranked at the top of his category in a funding competition. “Radiochemistry is fast-paced and exciting, as you’re doing chemistry with the restriction of a radioactive half-life—which means that eventually what you are making will decay down to nothing,” he said. Before coming to USask in 2016, Price did a post-doctoral fellowship at Memorial Sloan Kettering Cancer Centre in New York City, where he worked with many different radionuclides for treating and imaging cancer. He moved to Saskatoon to start his research lab in the USask chemistry department and at the Saskatchewan Centre for Cyclotron Sciences (SCCS), which is owned by USask and operated and managed by the Sylvia Fedoruk Canadian Centre for Nuclear Innovation. Price noted the investments USask and the provincial and federal governments have made to establish the Fedoruk Centre and the SCCS, which includes a cutting-edge TR24 24 MeV cyclotron. This infrastructure, in part, helped attract Price to USask. “Along with this new infrastructure came an open tenure-track faculty position in the Department of Chemistry, which also included an open Canada Research Chair in Radiochemistry position. These factors, along with a very strong chemistry department and generally an excellent campus, helped convince me to apply for the job and eventually to move here from my previous position at Memorial Sloan Kettering Cancer Center in New York City. Having lots of synergy with other great faculty at USask who do radiochemistry research, such as Dr. Chris Phenix—we work very closely together—have also made USask a very attractive place for me to spend my career,” said Price. “The SCCS is a new and major radiochemistry and molecular imaging research facility that is still growing and being renovated and equipped, and we have the potential to be one of the best in Canada. The most important part of research is the people, and I have been fortunate to recruit excellent undergraduate and graduate students and a postdoctoral fellow, Dr. Elaheh Khozeimeh Sarbisheh(SHRF PDF Fellowship 2017-2019),” he added.